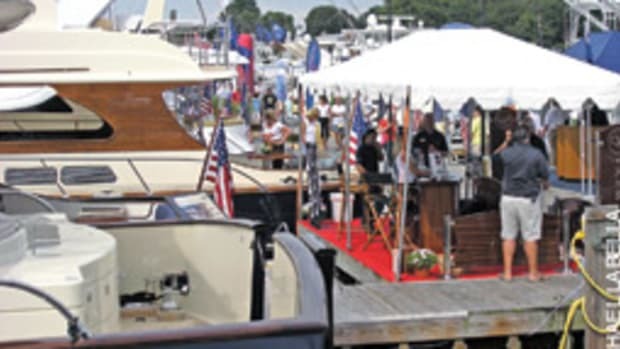 Heavy rain last Sunday washed out the final day of the Norwalk (Conn.) Boat Show & Waterfront Festival, which saw a 29 percent increase in attendance from 2008 through the first three days of the show. Because of the dismal last day, however, the show wound up with a 17 percent overall decrease in attendance, with final figures listed at 19,862, according to the National Marine Manufacturers Association, which produces the show. Attendance in 2008 was 24,015. Exhibiting dealers reported strong crowds and good leads at the Sept. 24-27 show, which featured a new festival component to expand its reach in the market. Between 350 and 400 exhibitors were expected, organizers said prior to the event, though exact figures were unavailable. Many exhibitors noted a smaller show footprint than in past years. "The show was pretty good, the traffic was strong - it was definitely better than last year," said Mitchel O&apos;Hara Jr., owner of Candlewood East Marina in Brookfield, Conn. O&apos;Hara sells Cobalt, Malibu and Nautique boats. Next year&apos;s show is scheduled for Sept. 23-26.